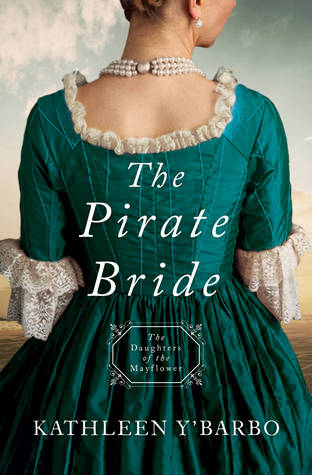 The Pirate Bride (2018) by Kathleen Y’Barbo is the second book in The Daughters of the Mayflower series. This novel comes in all forms including eBook, and is 251 pages in length. With a full-time job, a precocious five-year old at home The Pirate Bride took me one day to read. I received a copy of this novel in paperback form from Barbour Publishing. In no way has this influenced my opinion of the story. All opinions expressed in this review are my own. I give The Pirate Bride 4 STARS. This novel is a Historical Christian Romance. If I had one word to describe The Pirate Bride by Kathleen Y’Barbo that word would be “fun”! This book is fast-paced and highly “un-put-downable.” The characters, especially Maribel, are well-written, and the action and adventure is non-stop. This is my first time to read a book by Y’Barbo, but it will not be my last. I enjoyed escaping into this story line and will miss Maribel’s fabulous antics. Maribel is my favorite part of this book. She is brave, witty, perceptive, and hilarious. I laughed out loud quite a few times. She gets on these talking jags and they are just so funny. Whether a 12-year old aboard a Pirate’s — er, I mean — a Privateer’s ship, or a beautiful 23-year old on an island that houses the orphanage she grew up in, Maribel is a force to be reckoned with. What I liked best about Maribel’s character is her ability to not give in to fear. In fact, whenever she feels fear rearing its ugly head, she repeats “Pray away the fear, pray away the fear.” Maribel puts her focus on talking to God, which naturally takes her brain away from her fear and then she is able to act. Jean-Luc, the Pirate hero, is an impressive character. He is handsome, intriguing, and kindhearted. But, he is also commanding and intense. He definitely needs Maribel in his life to help his lighter side come out every now and then. What is really fun about this book is the interesting and unusual ship that Jean-Luc captains. The men are all good. They have values and a moral compass. Not quite what one would expect when reading a Pirate story, so in that it is not quite historically accurate, but it does make for a very charming read. My favorite crew member is Israel Bennett. He loves God big time, defends those he cares for, and is so loyal. I love how protective he immediately feels towards Maribel — Israel becomes a stand-in father of sorts. It is sweet. In fact, I love how Jean-Luc’s entire crew immediately bonded to Maribel and took care of her in very considerate and tenderhearted ways. If you are looking for a great story to escape into, then I highly recommend The Pirate Bride. There is not a boring moment in this book. It has pirates, battles, deception, mystery, and a sweet romance. I guarantee you will enjoy this fun adventure! I am giving away ONE (1) paperback copy of The Pirate Bride by Kathleen Y’Barbo. The giveaway begins today, 4-1-18 at 4:45 pm (PST) and ends on Thursday, 4-5-18 at 12:00 pm (PST). To enter, click on the Rafflecopter link below. Good luck! I have not read any of her books, but I did read the first book in this Barbour series. They did a fabulous job on all the covers and I’m interested to see if there is any consistency among the authors/books or if they have threads that tie them together. I still haven’t read the first book in this series. I have it. I just lack time!!! I’m reading this right now. I’ve also read other books by Kathleen. She is very funny and a great writer. I am definitely checking out her other books, Paula!!! I’ve never read her books, but I love a good pirate story! This is definitely a fun pirate story! This is a new author for me, but am looking forward to reading this book. Thank you for a chance to win. Sounds a unique and interesting book! It’s definitely unique. And, a lot of fun! I haven’t read any of Kathleen’s books but I’m so excited about this series! I can’t wait to read it! I saw this book at Sam’s Club and so wanted to buy it, now I want to read it even more! Thank you for your review! I have not read any books YET by Kathleen Y’Barbo. Thanks so much for the chance to win a copy. You’re welcome! Thanks for commenting. 😊 It’s a fun, quick read for sure! It was a 4 for me because the ending felt rushed and the balance of the book is a little off for me. The first half of the book, the main character is 12 and the hero is 25. The second half, she is 23 and he is 36. The amount of time they spend in the end of the book together at an appropriate age is not enough time for me to really feel like the relationship was anything more than insta-love. It feels like the author really got into her story, but then maybe realized she had a page limit and rushed the ending. But, none of it took away from the story. I really had fun with this one! I have not read any books by this author, but I’ve seen this book at least 5 times in 24 hours on all the blogs. It sounds great, and love the cover. Kathleen Y’Barbo is a new author for me. Oh this sounds so good! !